1919 Map of New York City’s Manufacturers Shows a Bygone Industrial Landscape #manufacturing monday « Adafruit Industries – Makers, hackers, artists, designers and engineers! 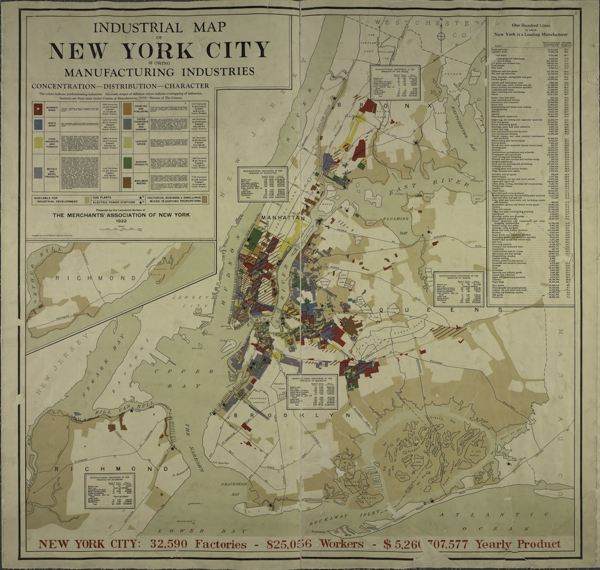 The Vault dug up this cool map from 1919 showing industrial activity in New York City. While manufacturing in New York City has greatly declined since then, companies like Adafruit continue to keep it alive and thriving. We are proud to be one company that continues to manufacture our products in NYC! This map, printed by the Merchants’ Association of New York in 1922, shows industrial activity in the city, as reported to the 1919 Census of Manufactures. The map was meant as a promotional tool—beige areas represent areas “available for industrial development”—and to boost the city’s profile in the larger business community. In the upper right-hand corner of the map, a box lists the “lines” (or types of manufactured goods) in which New York’s factories competed. In 1919, this list shows, New York produced more than 50 percent of total national output in 12 lines of manufacture, and was competitive in many more. Harris points out that although factories tended to move outward into the boroughs after 1919, before WWII the city did retain many factories in its central core, bucking the nationwide trend of suburbanization of industry. In 1940, 60 percent of New York workers had manufacturing jobs. In recent years, the city’s economy has rested on the service and financial industries. While manufacturers still do set up shop in the city, the scope of their activities is specialized. According to the New York City Economic Development Corporation, industry now provides just 16% of private-sector jobs. New York still produces garments, textiles, and printed material, and has increased production of packaged foods, but city factories tend to be smaller and to employ fewer workers.